Background: Prescription practice for tumour necrosis factor α (TNFα) inhibitors has changed towards treating patients with lower disease activity. Objective: To determine the trend in treatment response in cohorts of patients with rheumatoid arthritis who started TNFα inhibitor treatment between 2000 and 2005. Methods: 1813 patients with RA starting treatment with biological agents in 2000–5 were registered prospectively in the nationwide DANBIO Registry. Baseline disease activity and 12 months’ treatment responses were determined in cohorts based on start year (2000/1; 2002; 2003; 2004; 2005). Results: Despite decreasing baseline disease activity from the 2000/2001 cohort to 2005 cohort (28-joint count Disease Activity Score (DAS28): from 5.9 to 5.3 (p<0.001)), the 12 months’ DAS improvement increased from 1.8 units (2000/2001 cohort) to 2.2 units (2005 cohort) (p<0.001). The fraction with good EULAR response increased from 28% (2000/2001 cohort) to 50% (2005 cohort); the fraction with no response decreased from 29% (2000/2001 cohort) to 16% (2005 cohort). ACR20/50/70 response rates increased from 53%/31%/13% (2000/2001 cohort) to 69%/51%/30% (2005 cohort). After correction for withdrawals, treatment responses were lower, but patterns unchanged. One-year drug survival was for the 2000/2001 cohort: 73%, 2002: 62%, 2003: 67%, 2004: 70%, 2005: 69%. Conclusion: From 2000 to 2005, significantly improved treatment responses to TNF inhibitors were seen in clinical practice despite decreasing baseline disease activity levels. This lends support to the less stringent prescription practice towards treating patients with lower disease activity that has been observed in several countries. The aim of this study was to evaluate the trend in treatment response and drug survival in cohorts of patients with RA treated with a biological drug from 2000 to 2005. From 1 October 2000 to 31 December 2005, 1813 patients with RA, who initiated biological therapy for the first time were registered in the nationwide DANBIO Registry. Five cohorts were identified according to the calendar year of treatment initiation. Gender, age, years since diagnosis, number of previous disease-modifying antirheumatic drugs, 28-joint count Disease Activity Score (DAS28) (C-reactive protein-based; http://www.das-score.nl (accessed 7 April 2008)), glucocorticosteroid dosage, methotrexate dosage and biological drug were registered at baseline (table 1). For each cohort, the DAS28 and EULAR disease activity levels were determined at the start of treatment and at 12 months’ follow-up. Improvements in DAS28 and EULAR treatment response rates were calculated. The proportion of patients, who achieved ACR20 (20% improvement according to the American College of Rheumatology criteria), ACR50 and ACR70 responses after 12 months, was calculated. Withdrawals were registered prospectively. In 2002, coverage was 90%.3 In 2006 and 2007, all departments of rheumatology were asked to report how many of their patients were currently receiving biological agents. By comparing with the patients in the registry at the same time points, coverage was calculated to be 91% in 2006 and 92% in 2007. Statistical analysis was performed with R (http://www.R-project.org (accessed 7 April 2008), by an independent statistician. Data presented are on the study cohorts. Calculations on completers only gave similar results. We considered the patients who had a registered visit after 12 months of treatment to be representative of all the patients who were still receiving the drug. The LUNDEX factor was calculated to compensate for the patients who had withdrawn from treatment during the study period.4 The analyses were recalculated with patients treated only with infliximab and gave similar results. The Cochran–Armitage test for trend (dichotomous variables), and Jonckheere–Terpstra test for trend (continuous variables) were used. Adherence to treatment was evaluated by Kaplan–Meier plots and log rank statistics. A p value <0.05 was considered significant. The Danish Data Registry approved the registry. Patients gave their written informed consent at inclusion. According to Danish law, the registry did not require approval by the ethics committee. From the year 2000/2001 cohort to the year 2005 cohort, a decrease was seen in baseline disease activity, previous number of disease-modifying antirheumatic drugs, percentage of patients receiving concomitant methotrexate or prednisolone and dose of prednisolone (table 1). The median age of patients increased, as did the dose of methotrexate. Disease duration was unchanged. An increasing fraction of patients started treatment with etanercept and adalimumab at the expense of infliximab. Despite the lower baseline DAS28 in 2005, DAS28 improvement after 12 months increased from 1.8 in the 2000/2001 cohort to 2.2 units in the 2005 cohort (table 1). The fraction of patients with high disease activity at baseline according to EULAR disease activity criteria (ie, DAS28 >5.1) declined from 71% in the 2000/2001 cohort to 56% in the 2005 cohort. The percentage of patients with a good EULAR response increased from 28% to 50%, whereas the fraction of patients with no response decreased from 29% (2000/2001 cohort) to 16% (2005 cohort). The LUNDEX-corrected EULAR responses were lower, because they correct for the fraction of patients who had withdrawn, but the patterns were similar (table 1). The percentage of patients who had achieved an ACR20 response after 12 months of treatment increased from 53% in the 2000/2001 cohort to 69% in the 2005 cohort. For ACR50 it increased from 31% to 51%, and for ACR70 from 13% to 30%. The LUNDEX-corrected ACR treatment responses were lower, but showed similar patterns (table 1). The percentages of patients still receiving the drug after 52 weeks were as follows: in the 2000/2001 cohort: 73% (95% CI 68% to 79%), 2002: 62% (55% to 69%), 2003: 67% (62% to 72%), 2004: 70% (66% to 74%), and 2005 cohort: 69% (65% to 73%) (fig 1). Figure 1 Drug survival of patients according to the year they started the first biological drug. Kaplan–Meier plot. In total, 46% of the patients in the 2000/2001 cohort, increasing to 68% in 2005 could not have been a candidate for participation in an RCT, because they did not fulfil all the standard inclusion criteria (swollen joint count ⩾6, tender joint count ⩾6, C-reactive protein ⩾10 mg/l, and age <70 years). Our study showed that despite a change in prescription practice during the period 2000 to 2005 towards initiation of treatment in patients with RA with less disease activity, the efficacy of the treatments improved over the years as evaluated by DAS improvement in absolute numbers, by EULAR and by ACR treatment responses. By 2005, half of the patients who were treated for 1 year achieved a good treatment response, in contrast to only a quarter of the patients who started treatment in 2000/2001.8 During the same period, the percentage who achieved an ACR70 response increased from 13% to 30%. This improvement is remarkable, because during the same period, the fraction receiving concomitant prednisolone was reduced from 66% to 41%. The impact of concomitant methotrexate is unclear: The fraction of patients who received methotrexate decreased from 81% in the 2000/2001 cohort to 71% in the 2005 cohort, whereas the median methotrexate dosage nearly doubled from 12.5 mg to 20 mg weekly. One reason for the improvement in treatment response may be an increasing number of available TNF inhibitors, which may have lead to an increased likelihood of switching between biological agents.9 However, our analyses included only the first course of biological drugs, and we found that the drug survival was largely unaffected by the year of treatment initiation. Furthermore, calculations on only the patients treated with infliximab gave similar results. Patient selection for treatment with biological agents might have biased the response rates in the first years of postmarketing use, with many cases of longstanding, partly burnt-out disease. However, the trend for improved response seems to have continued also in the later years. RCTs of TNF inhibitors in populations resistant to methotrexate monotherapy have shown that ACR50 responses are achieved in 21–69% of patients, and two recent meta-analyses concluded that the efficacy of the TNF inhibitors does not differ significantly among each other.10 11 Most of the patients in our study would not have been eligible for inclusion in controlled clinical trials, which supports the finding of others.6 7 Two population-based studies suggested that the response rates of anti-TNF treatments in routine care as judged by ACR20, ACR50 and ACR70 responses were smaller than in RCTs.6 7 Our findings do not support this, since we found ACR50 to be achieved in 43% of completers. Of all patients who started treatment with biological agents, including withdrawers, 43% achieved an ACR20 response, 30% an ACR50, and 16% an ACR70 response after 52 weeks. There are only few reports of efficacy of biological drugs outside clinical trials. In Sweden, a good EULAR response was seen in 33–35% of 949 patients at 12 months,4 which is of a magnitude similar to our findings. Similarly, in 120 British patients who received infliximab, 48% achieved a good EULAR response after one year.12 In a Swiss study, in contrast, the improvement in DAS28 was only approximately 0.60 units compared with 1.8 in this study.13 We have no explanation for this difference, which was supported by the finding of a EULAR good response of only 10% in the Swiss study in comparison with 26–49% in our study. One-year adherence to treatment has been reported to be 60–80%,4 13–15 which is in accordance with our findings. In conclusion, as far as we know, this is the first nationwide documentation of the efficacy of biological agents in patients with RA treated in standard care. 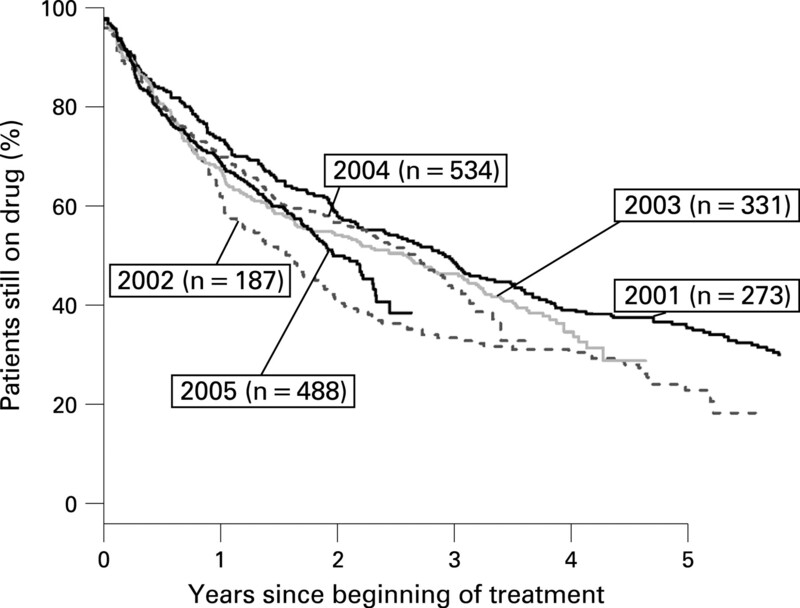 From 2000 to 2005, significantly improved treatment responses to TNF inhibitors were observed in clinical practice, despite decreasing baseline disease activity levels. The study emphasises the need for observational studies of efficacy in addition to RCTs of treatment with biological agents. The sponsors are acknowledged for their support. They have had no influence on data collection, analysis or publication. Statistical analyses were performed by Zitelab Aps. The DANBIO study group comprised departments of rheumatology at the following hospitals in Denmark: Ålborg, Århus, Bispebjerg, Esbjerg, Frederiksberg, Gentofte, Glostrup, Gråsten, Herlev, Hjørring, Holbæk, Holstebro, Horsens, Hvidovre, Hørsholm, Kolding, Næstved/Nykøbing Falster, Odense, Randers, Rigshospitalet, Roskilde/Køge, Silkeborg, Slagelse, Svendborg/Fåborg, Vejle and Viborg.
. Prescription practice of biological drugs in rheumatoid arthritis during the first 3 years of post-marketing use in Denmark and Norway: criteria are becoming less stringent. Ann Rheum Dis 2005;64:1220–3.
. DANBIO: a nationwide registry of biological therapies in Denmark. Clin Exp Rheumatol 2005;23(Suppl 39):S205–7.
. Routine database registration of biological therapy increases the reporting of adverse events twentyfold in clinical practice. First results from the Danish Database (DANBIO). Scand J Rheumatol 2005;34:40–4.
. The LUNDEX, a new index of drug efficacy in clinical practice: results of a five-year observational study of treatment with infliximab and etanercept among rheumatoid arthritis patients in southern Sweden. Arthritis Rheum 2006;54:600–6.
. Health economic issues in rheumatoid arthritis. Scand J Rheumatol 2006;35:415–25.
. Effectiveness of tumor necrosis factor inhibitors in rheumatoid arthritis in an observational cohort study: comparison of patients according to their eligibility for major randomized clinical trials. Arthritis Rheum 2006;54:3399–407.
. The efficacy of anti-TNF in rheumatoid arthritis, a comparison between randomised controlled trials and clinical practice. Ann Rheum Dis 2007;66:1473–8.
. Low remission rates but long drug survival in rheumatoid arthritis patients treated with infliximab or etanercept: results from the nationwide Danish DANBIO database. Scand J Rheumatol 2007;36:151–4.
. Do rheumatoid arthritis patients in clinical practice benefit from switching from infliximab to a second tumor necrosis factor alpha inhibitor? Ann Rheum Dis 2007;66:1184–9.
. Long-term infliximab treatment in rheumatoid arthritis: subsequent outcome of initial responders. Rheumatology (Oxford) 2007;46:1153–6.
. Tolerance and effectiveness of anti-tumor necrosis factor alpha therapies in elderly patients with rheumatoid arthritis: a population-based cohort study. Arthritis Rheum 2007;57:679–85.
. Treatment continuation in patients receiving biological agents or conventional DMARD therapy. Ann Rheum Dis 2005;64:1274–9.
. Survival during treatment with tumour necrosis factor blocking agents in rheumatoid arthritis. Ann Rheum Dis 2003;62(Suppl 2):ii30–3. Competing interests: MLH has received consulting fees, speaking fees or research grants from Abbott, Centocor, Roche, Schering-Plough, UCB-Nordic and Wyeth, and she has received grants from Abbott, Bristol-Myers Squibb, Roche, Schering-Plough, UCB-Nordic and Wyeth on behalf of DANBIO. HML has received consulting fees from Roche. AH has received consultant fees or speaking fees from Abbott and Schering-Plough. JP has received consultant fees or speaking fees from Wyeth, Abbott and Bristol-Myers Squibb. JU has nothing to declare. VSR has received consulting or speaking fees from Abbott, Schering-Plough and Wyeth. MØ has received consulting fees, speaking fees or research grants from Abbott, Amgen, Bristol-Myers Squibb, Centocor, Genmab, Glaxo-Smith-Kline, Pfizer, Roche, Schering-Plough and Wyeth. UT has received consulting or speaking fees from Abbott, Genmab, Schering-Plough and Wyeth. Funding: DANBIO is indebted to the head of the Institute for Rational Pharmacotherapy, Jens Peter Kampmann, who hosted and financed the database from 2000 to 2003. Abbott, Wyeth and Schering-Plough (since 2004), Bristol-Myers Squibb and Roche (since 2006), and UCB-Nordic (since 2007) have sponsored DANBIO with unrestricted grants. Danish Regions gave financial support to the activities related to quality improvement of biological treatment. The principal author received a grant from the Danish Rheumatism Association and the Margarethe Astrid Hedvig Schaufuss Legat. All departments of rheumatology in Denmark are listed in the appendix.